On Thursday morning, Stanford’s long-range planning Area Steering Group (ASG) white papers were officially released and made viewable to Stanford affiliates. The 37 papers represent the efforts of four ASGs to compile high-level summaries of the over 2,800 ideas and proposals submitted by faculty, staff, students and other members of the University community at large. The long-range planning process, launched early last year, seeks to crowdsource thoughts for Stanford’s future. 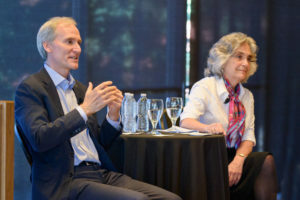 “The white papers demonstrate the depth of the University community’s engagement with the long-range planning process, the care with which the area steering groups have reviewed the proposals and our community’s commitment to making meaningful contributions to help solve large global problems,” University President Marc Tessier-Lavigne said in an interview with Stanford News. The campus community now has a 30 day comment period to submit written feedback. The president and provost also plan to host University-wide discussions. The four ASGs — Education, Research, Community and Engagement Beyond Our University — wrote documents covering a wide range of topics including diversity, educational equity and outreach, housing affordability, sustainability and more. With over 100 members across the four groups, including both undergraduate and graduate students, staff, faculty and postdoctoral scholars, the ASGs helped organize, frame and editorialize the submitted ideas into a collective framework for Stanford’s future. These papers will ultimately inform the operational decisions made by the University’s Executive Cabinet as it processes the proposals in consultation with the Board of Trustees. The Executive Cabinet is comprised of the president, provost, deans, vice provosts and the directors of SLAC and the Hoover Institution. “The white papers are the product of hours of hard work by the area steering groups and represent a synthesis of the thousands of ideas collected,” Associated Students of Stanford University (ASSU) President Justice Tention ’18 said. Notably, the documents address the expansion of financial aid to provide need-blind admission for international students and increased educational accessibility for low-income applicants, as well as a re-imagining of the broad curriculum to increase undergraduate exposure to the humanities. Also emphasized were the need to instill a culture of inclusion and equal treatment, public service to both the local and global community and new research initiatives. In a blog post, Tessier-Lavigne and Provost Persis Drell pointed to a number of overarching themes across each of the white papers, including “affordability, diversity and inclusion, health and well-being, and institutional accountability.” They added that sustainability was such a significant issue among the papers’ stakeholders that all four steering groups contributed to a paper on the subject. John Zhao ’18, a student representative on the Engagement Beyond Our University ASG, said the University should incorporate feedback from the white papers into its operational processes and investments. In an effort to address top concerns in areas such as housing affordability, employee compensation and institutional change, the Provost’s Office has already overseen a number of initiatives over the past few months. The University is currently working to implement flexible work arrangements to mitigate long commutes and lack of affordable local housing, as well as a project to improve student-faculty advising relationships for graduate students. “We believe this process will make Stanford better and stronger as an academic institution,” wrote Tessier-Lavigne and Drell. Each submission to the long-range planning process was read by at least two ASG members per group, with no proposals excluded from the review process. Following ASG review, all proposals were forwarded to the Executive Cabinet, which works in collaboration with the Board of Trustees. Pierson emphasized that each steering group worked independently from Executive Cabinet members and — with the exception of the jointly-crafted sustainability paper — from each other. Though the committees produced white papers with topical commonalities, she said, each group addressed recurring themes, such as equity and diversity, from their own specific angles. “The net gain from that is we have four groups approach this in their own distinctive way for their own areas, which I think is really wonderful,” she said. The Executive Cabinet will continue to review the white papers to construct a unified framework while the 30-day comment period is ongoing. In a statement to The Daily, Tention said the white papers will ensure the policies, institutional changes and projects that the long-range planning process ultimately yields will reflect community members’ ideas. Our Community steering group member Isabelle Foster ’18 advocated the continued involvement of Stanford students in the long-range planning process. Zhao, however, criticized the long range planning process for its exclusivity on the committee level, citing the University’s process of selecting students to serve as part of the steering groups. Zhao also questioned the originality of proposed changes that the steering groups hoped to garner. Contact Courtney Douglas at ccd4 ‘at’ stanford.edu and Claire Wang at clwang32 ‘at’ stanford.edu.